Fresh from releasing their first album, Natty Dub label bosses Cabin Fever and Patman clears space in the schedule for a five track showdown of his own. Lean, spares and muscular are the power words of the day as Saxxon fuses classic late 90s jump up with future jungle and modern production touches. Highlights include the balance of atonal bass burps, the apache break and jazz chords on "Junction", the Sub Zero style bass plunges and classic gaming samples on "Street Fire" and the paranoid low end stretches and twisted soul sample on "Proceed". 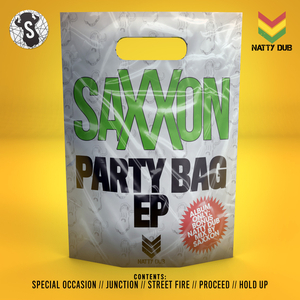 Complete with a cheeky 40 minute mix, Saxxon is spoiling us right here.